Funerals are something that must be handled with the upmost detail and special handling. The very same can be said about the funeral catering services. We, here at Elkhart Catering, do offer different funeral catering packages, and what makes these funeral catering packages outstanding is very evident. It is the fact that each catering package is versatile and totally adjusts to a person's need for them overall. We strive to make all of our funeral catering services as personal, as is possible, and that is because funerals must be handled with a personal warmth and caring like no other. 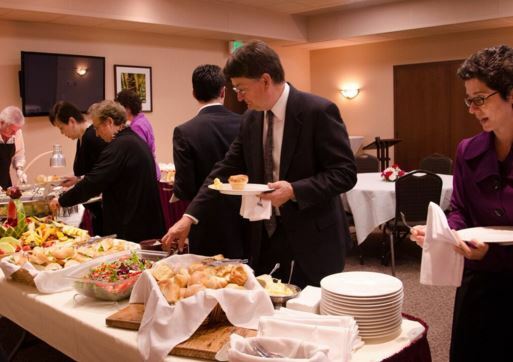 Elkhart Catering for funeral services is there to care with everything that one does require for funeral food catering. This is what we do, and what we are all about in essence, from start to finish. We provide you with a detailed catering menu for memorial service. We can also, come up with a special menu, if need be for those who request one from us in advance of the funeral date itself. We work very hard with all of our customers to give them, what they do need most, and this is a funeral food catering program like no other. Funerals and memorial services are something that can be difficult to have to bear. However, what Elkhart Funeral Catering Services does strive to do is this, and that is to bring about some comfort for the grieving process. We provide a funeral food catering menu that is very warm and personal in delivery. We know how hard it is.